I take this art very seriously and because of that I have been able to reach the highest goals I have set for myself while in the automotive industry. What has garnered me the respect and accolades I have gained as a Master Coach Builder in the industry is directly due to my dedication to learning and applying every thing and resource available to me at the time. Now, my goal is to make those who come to me for instruction better than I ever was on my best day. Mark Gerisch has been a standout figure in the metalshaping community for over 35 years. After receiving classical panel beater’s training in England, he returned to America and was soon building cars for the likes of Jay Leno, Bob Lutz, ZZ Top, the McCaw brothers, and many other classic car aficionados. His high-quality work producing complete Shelby Cobras and Ferrari 250s soon brought him to the attention of the nation’s top car magazines, and since the 1990s his coach work has graced the covers of many notable publications. When Ford Motor Company’s High Performance team decided to build a roadster version of their 2005/2006 street-legal Ford GT-40, Kip Ewing of the team came to Mark to ask for his help in bringing the GTX-1 to life for the upcoming 2005 SEMA show in Las Vegas. A car this beautiful could not stay a single design exercise so Mark was asked to take on a low production run of the cars and from that he was commissioned to build over 60 of them for the world’s most discriminating car collectors. Follow Mark Gerisch on Instagram! Your patience and expert welding skills required to repair our components were deeply appreciated. As a bonus: our Superbikes finished the race on Saturday 2nd and 3rd, and improved to 1st and 2nd on Sunday! I imagine your metal shaping practices are unparalleled, and we would highly recommend your training to individuals searching to perfect their metal working skills. 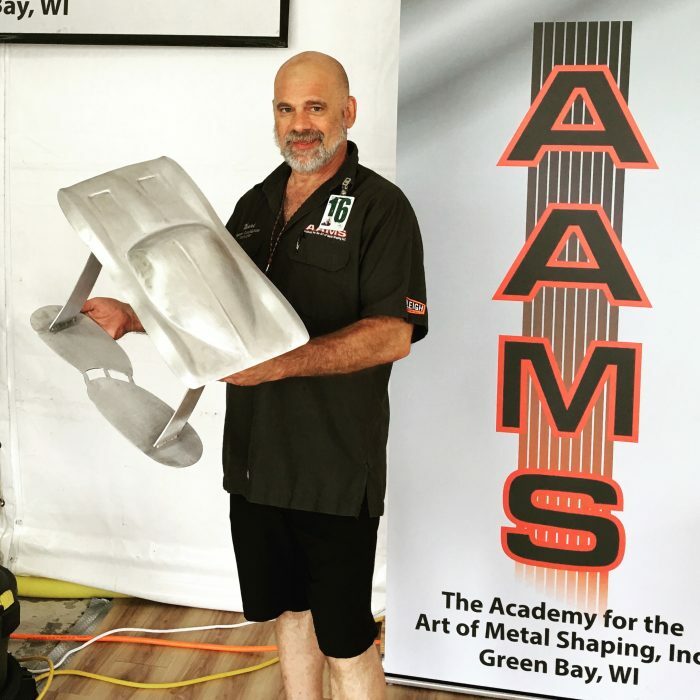 The dedication, support, and knowledge in aluminum frame and body construction you and AAMS displayed at the August 3-6, 2017 event at Road America were the very best I have seen at any event we have participated in. Had it not been for your skills and understanding of what needed to be done to one of our Huracan GT3 race cars we would have been unable to continue with this car for the weekend. Quick thinking and solution driven results on your part resulted in the outcome of us being able to return the car to the track the next morning as if nothing had happened the day before.